Most people have confusion about the difference between the Vibrance and Saturation sliders found in post-processing tools like Lightroom and Photoshop. 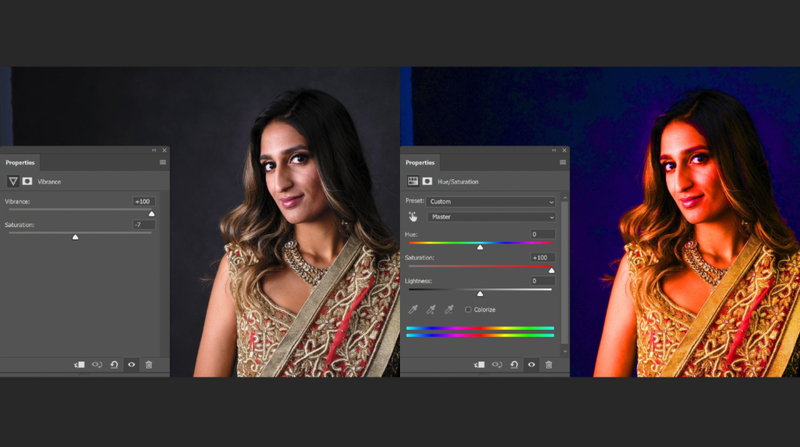 Both tools help increase or decrease the intensity of colors in an image, but if we understand more about the nature of these two tools it will surely benefit us during our retouching. I always say, “You should know your tool well enough that it becomes a part of your body.” That is how you create without thinking. Let’s take a look at the effect Saturation and Vibrance have. Saturation is generally more aggressive than Vibrance. It affects all colors and pixels in the image equally, regardless of how saturated they already are. If you are using the Hue/Saturation panel and push the slider all the way to +100 it will create some ugly posterization like the image below. As for the saturation slider in Photoshop’s Vibrance panel, it has a more subtle effect, but still affects all colors and pixels within the image. Vibrance will act as a smart tool. It cleverly increases the intensity of the more muted colors and leaves the well-saturated colors alone. It’s sort of like fill light, but for colors. Vibrance will also prevent skin tones from becoming overly saturated and unnatural. Does this apply to different retouching apps? Yes! Both Saturation and Vibrance work the same way no matter which application you use. Take a look at the following examples from several different tools.